Wow a demonstration to cheer us all up! Bright and colourful acrylics using a variety of brands available, Tas had a table with at least 50 tubes on. With palette knife and paint straight out of the tube Tas smeared it on a pre-coloured purple board and began composing a vase with bright red tulips. Gradually after initially placing the flowers he built up the layers developing the background first, with little mixing apart from where colour went on top of colour. Tas emphasised the need to have a composition in mind before starting and think about where colour marks were placed, it wasn’t random although it seemed like it with the array of colour used. As the acrylic tends to dry fairly quickly it was necessary to establish the design quite speedily in the first half of the session, and Tas needed the paint to be more malleable. Then as the painting developed more time was taken to place colour marks which brought out the flowers and stem details, highlighting with some very bright colours to complete a very lively picture. Just as we thought about putting our sunglasses away for the summer, this bright little gem appeared before our eyes. The Woodhouse Eaves self help group has had to move to Beaumanor Outdoor Learning Centre from next Tuesday due to changes at Woodhoues Eaves See attached map for the route from the main gates in Woodhouse. Just in case, Woodhouse is the small village between Quorn and Woodhouse Eaves and the main gates to Beaumanor are just before the spot roundabout, when travelling from Quorn. 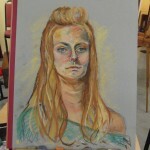 Charnwood College painting and drawing evening sessions.